Designed for suspension over choirs, instrumental groups and theatre stages, these condenser designs have steel-wire hangers, which attach to the cable, when suspended from above, and position the microphone head away from the vertical. All have a high maximum sound level capability, useful if directly above an orchestra. The ES954 hanging microphone is a quad-capsule, steerable microphone that has been designed for huddle rooms or conference rooms whereby capture of audio over a range up to 360-degrees is required. Designed to be used with the Audio Technica ATDM-0604 digital smartmixer the ES954 can, its most basic of setup scenarios, be configured to provide coverage to up to four points and automatically switch using gates to ‘follow’ a speaker. A more intensive setup could involve using the control of each capsule’s virtual cardioid or hypercardioid polar pattern, steered in 30-degree increments, or tilted for seated/standing speakers. A 360-degree LED ring around the rim of the microphone gives clear indication of the array’s mute status in red or green. 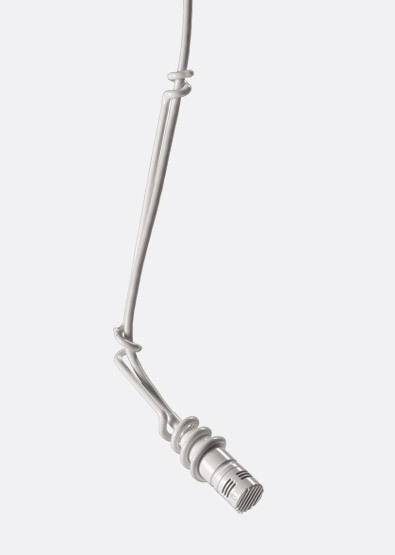 A fixed 1.2m cable can be connected to the included AT8554 Plenum-rated ceiling mount via push-type wire terminals for a more timely installation. Two RJ45 sockets on AT8554 allow compatible RJ45 terminated cables to be linked between the box and the included breakout cables. Polar pattern: Omnidirectional, O; Figure of eight, L/R/Z. Frequency response: 20Hz-16kHz. Open circuit sensitivity (0dB = 1V/Pa, 1kHz): -35dB, 15.85mV, O/L/R; -38.5dB, 11.9mV, Z. Impedance: 100ohms. Maximum input (1kHz at 1% THD): 132.5dB, O/L/R; 64dB, Z. Phantom requirements: 11-52V DC, 23.2mA, both channels driven. Weight: 160g, mic; 420g, ceiling mount. Dimensions: 61.6 x 111.8, mic, diameter x height; 36.6 x 106 x 106mm, ceiling mount, height x width x depth. Included accessories: AT8554 ceiling mount/breakout box, 1x 46cm RJ45 socket to 3x 3-pin female Phoenix connector, 1x 46cm RJ45 socket to 3-pin female Phoenix connector and unterminated LED conductors, seismic cable and accessories. 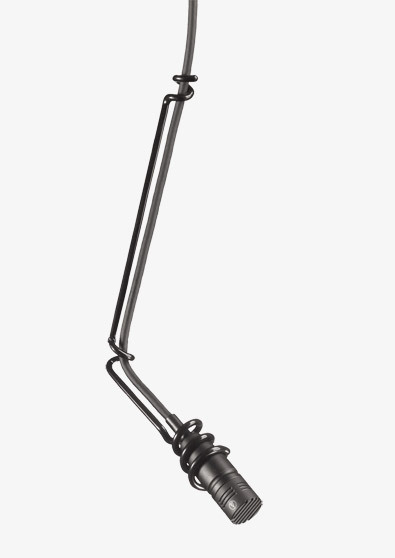 This cardioid condenser hanging microphone has a 120-degree acceptance angle and has been designed for use over choirs, instrumental groups and theatre applications. A 15.2 metre cable is permanently fixed to the microphone head and terminated with TA3F connector suitable for use with the ATND8734A microphone base Dante power module. Radio frequency interference (RFI) is kept to a minimum due to the integrated ‘UniGuard RFI-shielding technology used’. Frequency response: 30Hz-20kHz. Sensitivity: -40dB (10.0mV), re 1V at 1Pa. Weight: 0.2g. Dimensions (Length x Diameter): 27.5 x 8.4mm, microphone head. Included accessories: AT8019 foam windscreen, AT8452 steel hanger. 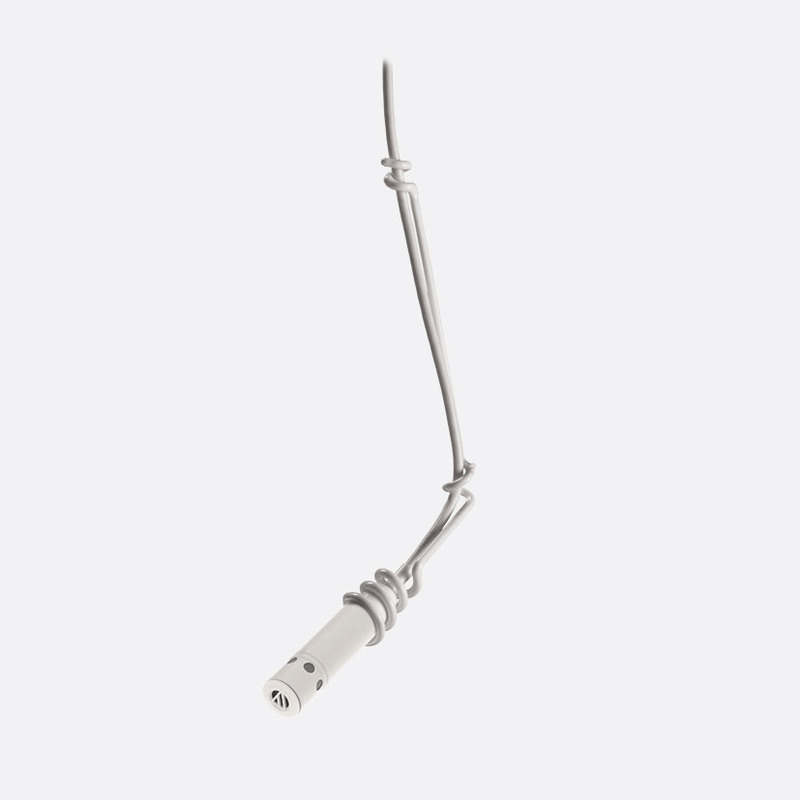 This hanging microphone has many of the same physical properties as the ES933C/MIC however it has a hypercardioid pickup pattern with a 100-degree acceptance angle. Frequency response: 80Hz-20kHz. Weight: 0.2g. Dimensions (Length x Diameter): 27.5 x 8.4mm, microphone head. This hanging microphone has many of the same physical properties as the ES933C/MIC however it has a ‘MicroLine’ pickup pattern with a narrow 90-degree acceptance angle. Weight: 9.5g. Dimensions (Length x Diameter): 146.5 x 8mm, microphone head. Included accessories: AT8138 foam windscreen, AT8452 steel hanger. With robust construction and unobtrusive appearance, this is a wide-range condenser microphone with a cardioid (unidirectional) polar pattern. It was designed for high-quality sound reinforcement and other demanding sound pickup applications. A 7.6 metre length of 2.6mm diameter cable is permanently attached to the microphone head, terminated with a 3-pin male XLR connector. Available in black or white. The output is low impedance, balanced. Requires 9V to 52V DC phantom power. Maximum input: 134dB SPL. Response: 70Hz-16kHz. Sensitivity: 14.1mV/Pa. Impedance: 100ohms, balanced. Dimensions: 57mm head length; 12mm head diameter. This is also a cardioid, condenser design, but with a wider frequency response, it is also suitable for recording work, as well as sound reinforcement. 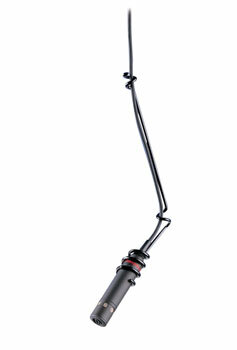 A 7.6 metre cable, 3.2mm in diameter, is attached permanently to the microphone. This terminates with a miniature XLR connector which connects to the included AT8531 power module, which has a switch to introduce a low-frequency roll-off, 80Hz, 18dB/octave, to reduce unwanted low-frequency sounds without affecting voice quality. The module has an XLR3-M balanced output connector and operates with a 1.5V AA battery (1200 hours, alkaline) or 11-52V phantom power. The capsule is interchangeable; hypercardioid, omnidirectional and UniLine line cardioid polar patterns are available - contact Sales. Available in black or white. Maximum input: 133dB SPL. Response: 30Hz-20kHz, sensitivity 7.9mV/Pa. Impedance: 200ohms, balanced. Dimensions: 34mm head length; 12.2mm head diameter. Included accessories: AT8153 two-stage foam windscreen, AT8451 steel hanger, AT8531 power module, AT8438 5/8 inch stand adapter, battery.